The ability to submit tasteful and relevant content for publication as an article in Technical Support Magazine. It MAY, subject to conditions, deal with your organization’s specific product or service. If your article is accepted, a Corporate Member will receive a complimentary ¼ page advertisement in Technical Support Magazine (regular price $750) or an upgrade to a full page ad for $750 (regular price $1500). Preference in speaking engagements at the annual NaSTEC conference. A 25% discount on a table or booth at the annual NaSTEC conference. Inclusion of your logo and link on the sponsorship page of the NaSPA Web Site. Enjoy a package worth thousands of dollars, targeted to a worldwide audience of technical professionals that WANT to learn more about the industry – and about YOU. At the same time be happy in the knowledge that you are assisting a venerable 30 year organization in its mission of service to technical professionals of all kinds. 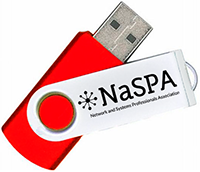 Visit our Corporate Member and Sponsor Section HERE for a look at other organizations just like yours who have taken the plunge in supporting NaSPA as a Corporate Member or Sponsor. Wouldn’t your logo look good on this site? Email advertising@naspa.com or join right now below. Publicly Traded Company: $2400 / Yr. Private or Non Profit Company: $995 / Yr.
$995 includes ONE email blast and THREE memberships. Other benefits are the same.